Happy Birthday, Fuzzy - I Have A Livejournal? That was all a coincidence, really, but I wouldn't change it for anything. On top of that, the 'AM' proves just how screwed up my sleep schedule is. Sweet honey mustard, you are the biggest nerd ever. 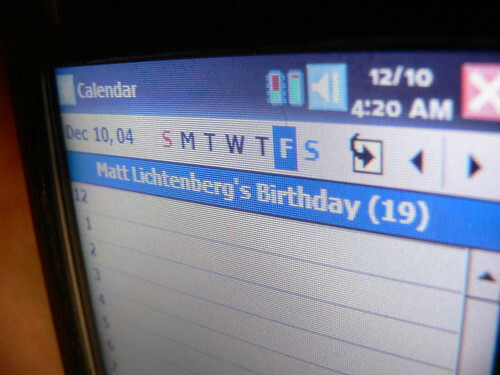 :D Happy birfday to Matt. Just you wait 'til Scudders' birthday. I have plans. Lichtenberg is an incredibly awesome last name. No, not really. You should IM me; I hear good things. ph34rthefuzzy, if you're AIM inclined. But about the last name: hate. Yes yes... Happy Birthday Fuzzy! ::plays last year's birthday card:: I dont know how I can top that... what do you want? I ask for nothing more than you showing up whenever we get together. And it looks like a Loop thing, so yes.